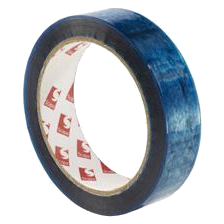 1140 is a transparent cellulose film single coated with a blue tinted solvent based rubber/resin adhesive with 45µ total thickness. Recommended for edging, masking, stripping and splicing applications. Designed for stripping up lithographic positive films. Does not affect the transmission of light through the tape. Not suitable for use in conditions of high humidity. Blue colour enables easy identification. Rolls should be stored flat on their cut edges in the original packaging. The product must be protected from dust, heat, moisture, direct sunlight and solvent fumes. Cellulose based products are sensitive to heat, moisture and storage conditions. When stored in their original carton at recommended conditions of +23°C and 50 % humidity, the best usage date will be within 6 months from the date of shipment. Surfaces should be clean, dry and free of dust, grease, oil or other contaminants.